Dutch pressing with STEMRA rights society on labels, but distributed in Germany manufactured covers. 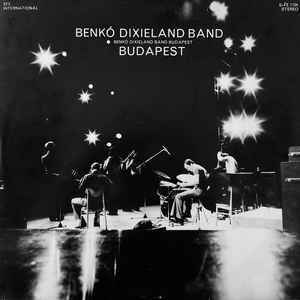 Recorded at the Benkó Dixieland Club, Budapest, April 1974. On labels: ℗ 77. The track duration on the back cover and labels differ and on track A4 there's even a difference of almost 2 minutes between the back cover and the label. In the track list on back cover, track A1 is misspelled as "Bill Bailley"; track A4 as "Some Of This Days". The titles have been submitted in their correct spelling. On back cover: "Studio for Enterprise, Munich SFE". Printed in Germany. At the bottom right corner of cover it however states "Petőfi", which on other Hungarian releases refers to an Hungarian printing company.